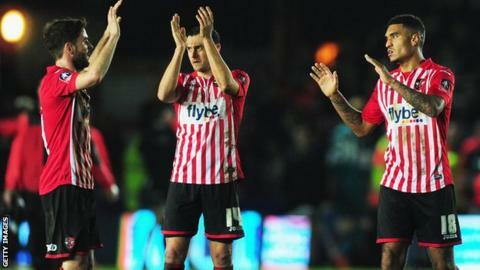 Exeter City's third-round FA Cup tie with Liverpool could be worth as much as £1m to the League Two side. The club expect that Friday's 2-2 draw, which was televised and attracted a crowd of almost 8,300 to St James Park, generated an income of around £250,000. It is estimated that City, owned by the club's supporters, could make £700,000 from the replay at Anfield. "We don't know the figures at the moment, but they will be substantial," chairman Julian Tagg told BBC Devon. "I would have thought we'd have made £250,000 or hopefully more. The point is that we've worked as hard as we can to sell as much as we can to make the evening what it was." Exeter twice went ahead against an under-strength Liverpool side, but were twice pegged back as the Reds forced a home replay. The cash would be a huge financial boon to Exeter, which as a fan-owned club that does not have a rich benefactor to bankroll them. When the club last made the third round in 2005, they drew Manchester United and earned a 0-0 draw at Old Trafford before losing to the Premier League side 2-0 in the replay. That result saw Exeter, who had been in dire financial trouble at the time, pay off their debts and begin a recovery which would eventually lead them to promotion from the Conference and see them climb to League One. But while Exeter's fans can look forward to another trip to a top-flight side, their manager Paul Tisdale was a little disappointed with the result. "I'm a football manager, I want to win games," he said. "I know everyone's talking about Anfield, but we were a goal up with 15 minutes to go.